New York is a city that never sleeps as said by legend Frank Sinatra. NYC has bubbling nightlife, amazing food, diverse culture and warm people. The Manhattan skyline is one of a kind. There is Central park which is famous globally, excellent system of transport available 24 hours, 24/7 salons, restaurants, theater and music. Visiting New York is an incredible experience for travelers. USAOnline brings a perfect one day or 24 hours trip planner for you. 7 am- Start with the long morning walk at the Central Park, known for its scenic beauty. You will get to see loads of New Yorkers. You can also rent bike if you don't want to walk or if short of time. Explore the zoo, the John Lennon memorial, Belvedere Fountain and the Lake and walk across to the Metropolitan Museum. Don't forget to grab a famous cappuccino of Joe's. Take a subway from Metropolitan Museum to Battery Park. 9 am- Take a Statue Cruise Tour of Liberty and Ellis Island where you get to see Lady Liberty at a closer view and also the astounding views of Lower Manhattan, Brooklyn and New Jersey. They cruise you right on over to the Statue of Liberty. 11am- Take a subway back to Manhattan, get down at 5th avenue for Empire state building for a complete view of New York City. You can also take a sky ride which is included in tickets and audio tour is free. Take a quick bite at Ai Fiori or The NOMad. 12 pm- Take a cab to Upper East Side, Madison Avenue from 61st to 72nd street. Explore the shopping world with presence of Ralph Lauren, Valentino, Tom Ford, Armani, Chloe, Gucci, Prada etc. Cut across to Fifth Avenue where there are nine museums waiting for you. Don't forget to see Roman and Greek galleries at Met. 2 pm- New York City has the finest restaurants in the world credit to a variety of cuisine goes to its immigrants from all over the globe. Visit Aldea if you want to try Portuguese dishes run by chef Georges Mendes himself, try Delicious smoked chicken pizza at Harry's, Thai food at Kin Shop, Ukranian food at Veselka, Spanish food at La Nacional and many more. 3 pm - Take a cab to the Rockfeller Center in the Midtown Manhattan which is composed of 19 grand building and famous for amazing lightening of the giant Christmas tree, TV Studios. Make sure to do the Top of the Rock Observation Deck as well. Here, you'll get 360-degree views of the New York City skyline, including Central Park, the Empire State Building and Lower Manhattan. Grab a coffee from Blue Bottle Coffee, Bouchon Bakery or Starbucks. 5 pm- Take a cab to East Broadway for New York Public Library which is famous not just for books but for its beautiful architecture. It is as much a museum as a functioning library. You would love to read books like never before. Don't forget to see reading room and take a walk at Bryant Park at the end. 6 pm- Visit New York Supermarket nearby and see what's different at the stores. Visit whole food market for Gourmets or specialty products. Visit InDessert for its famous fruit soups and shaved ice. 7 pm- Take a cab to Times Square and visit Madame Tussauds to take a look at your famous celebrities. The staff is friendly and lets you take selfies with your favorite actors and singers. 8 pm- Visit Intrepid Sea, Air & Space Museum just few steps away from Madame Tussauds and experience the amazing Cold War-era submarine Growler, first space shuttle Enterprise, the world’s fastest jets, a British Airways Concorde and legendary aircraft carrier Intrepid . 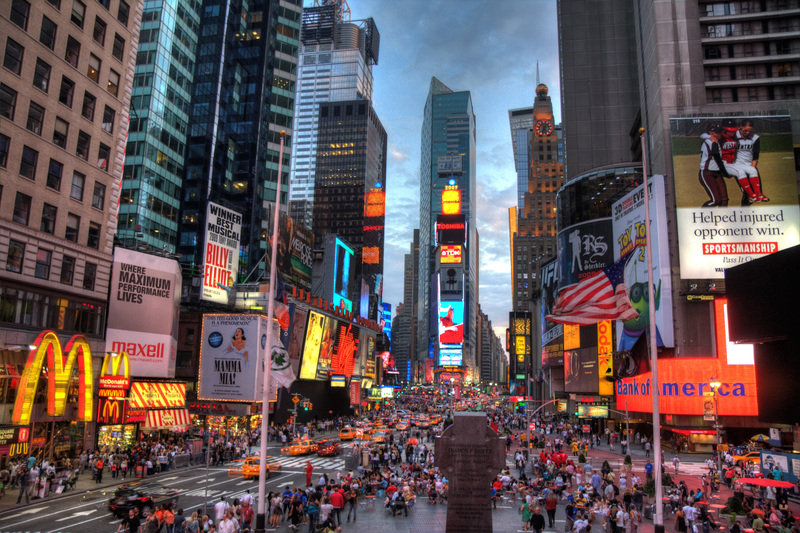 9 pm- Times Square is a popular destination for traveler and is famous for its variety of restaurants. Try Ma Po bean curd at Szechuan Gourmet, Chicken teriyaki at Teriyaki Boy, 10 oz. sirloin steak at Tad's Steaks , Borek at Gazala Place, Cheese blintzes at Cafe Edison and many more. The place is famous for its cuisines. 10 pm- New York is the city that never lets you sleep.Walk-in to Gotham Comedy Club and the Comedy Cellar, the world famous comedy venues for their wonderful comedy theater. Check out the shows information here.You can also visit the Brooklyn Museum which remain open until 11 p.m.
11 pm- Visit nearby clubs to experience New York's lifestyle. Take your favorite toasty tortas at Grand Morelos, gooey pizza slices at Artichoke Basille and American American staples at Empanada Mama. They are open till 5 a.m.
12 am- Take a cab to Williamsburg for beer gardens and great bars. Visit Turkeys Nest, Barcade, Union Pool, Spike Hill and many more. The Williamsburg Music Hall is must see venue if you are a music lover or enjoy great music and you have an option of the Knitting Factory and Trash Bar too. Explore map for your one day tour to NYC.